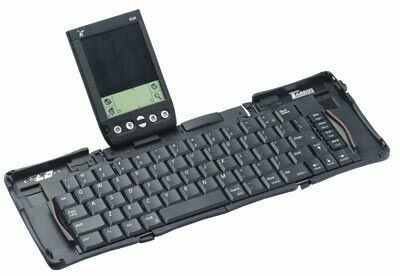 Have you ever wanted to completely ditch your laptop and just use the Handspring Visor, but couldn't because of all of the typing that you do? Are you a student and want to type your notes as the instructor is talking instead of scribbling them down and typing them up later? If so, the Targus Stowaway keyboard, which was designed by Think Outside, is for you. One look at the Stowaway when it's closed lets you know it is something special. At only 3.6" x 5.1" x .8", it's not much larger than the Visor itself. Pull a switch on the side and the Stowaway opens to reveal a full size keyboard inside. Once it's open, simply slide the sides together, pull out the back that holds the Visor upright, and place the Visor in its spot. There are holes on both sides of the keyboard where you can keep your stylus as you type. The keyboard layout is 100% full size standard QWERTY, with key spacing the same as desktop keyboards and key travel the same as laptop keyboards. There are designated keys for the Datebook, Phone, To Do, and Memo applications, and a function key (Fn) for special commands. The layout for the arrow keys is the standard inverted T.
Targus is making cases for users that want to carry their Visor and the Stowaway in one case. The one that Targus currently recommends is their leather mini notebook case, which can hold the Visor, Stowaway, travel cards, spare batteries, and Springboard modules. There are various dedicated keys and keys that are enabled by the Fn key. Below are the keys that you will find on the Stowaway keyboard for comparison against other keyboards. » Size - open 13.8 x 5.1 x .4 in. » Size -closed 3.6 x 5.1 x .8 in.